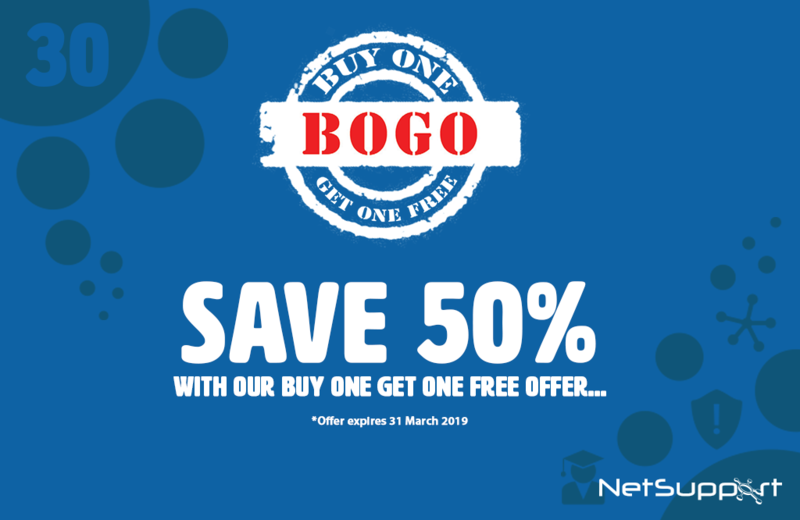 To help budgets go further, NetSupport is offering ‘buy one get one free’ on all its solutions, helping organizations to save money while gaining the benefits that NetSupport’s products provide. Providing a complete overview, IT Asset Management solution, NetSupport DNA, tracks, monitors and manages IT assets across multiple sites, helping to support effective enterprise or school management. In the education edition, internet safety features are provided as standard. Its desktop Remote Control solution, NetSupport Manager, delivers industry-leading multi-platform remote control to help businesses manage and support systems securely and efficiently from anywhere. NetSupport School is the company’s award-winning Classroom Management solution that supports teachers with dedicated assessment, monitoring, collaboration and control features to enrich lesson delivery. With browser-based Help Desk solution, NetSupport ServiceDesk, IT support teams can deliver effective and timely responses to IT issues and reduce the potential financial impact of downtime. Mass Notification tool, NetSupport Notify, helps business communicate instantly with staff using immediate and scheduled one-way alerts that can’t be ignored. With over 18 million users worldwide and finalist/winner in over 250 awards, NetSupport’s solutions provide real benefits and added value to any organization. Hurry, the offer ends on the 31st March 2019! For more information about this offer click here.